Son of 9/11 victim on Free Fall Radio + Year-End Fund Drive! 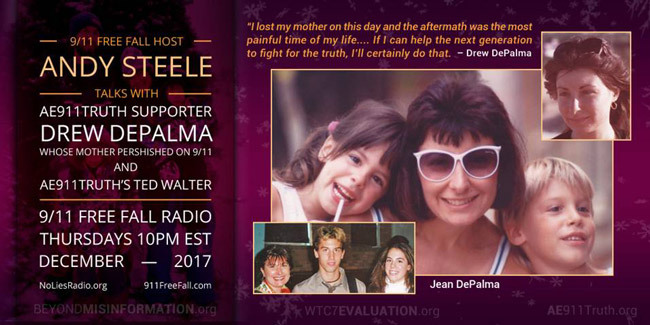 Free Fall host Andy Steele is joined by recent AE911Truth petition signer Drew DePalma, whose mother, Jean DePalma, perished in the World Trade Center's North Tower, and AE911Truth Director of Strategy and Development Ted Walter. Drew shares his story and his motivation for joining AE911Truth’s efforts, while Ted gives an update on the Bobby McIlvaine Act, including the recent video featuring Bob McIlvaine, which just eclipsed one million views on Facebook. Please Donate to Keep AE911Truth Going Strong! We are now in the fourth day of our year-end fund drive, which runs until December 31st. The purpose of this fundraiser is to fill our remaining 2017 funding gap and carry us into the new year on a strong footing. With a donation of $25 or more ($30 for non-U.S. residents), you will receive a gift of 50 Bobby McIlvaine Act “palm cards” to hand out in your community. Once we reach our goal of 1,000 donors, together we will have distributed 50,000 palm cards, which you can hand out in the coming weeks and months. Please make your year-end tax-deductible donation today so that we can continue the fight in 2018. We thank you for your support and dedication to the cause. If you’re not in a position to give $25, we totally understand. Whatever amount you can chip in will help us reach the goal — and we thank you for! 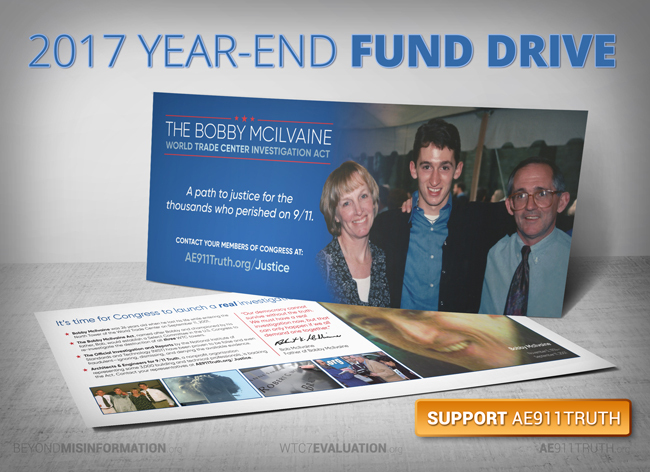 Plus, anyone can join the grassroots outreach effort by printing Bobby McIlvaine Act palm cards at home using this PDF.